This is ridiculous. Nobody needs this much Nerf gun. But the nice thing about Nerf’s new Modulus blaster is you get to pick just how much you want. The $50 Nerf Modulus ECS-10 is actually a pretty decent blaster. It’s one of the quietest, furthest-shooting magazine-fed, battery-powered, flywheel-driven dart shooting designs you can get without modding your Nerf guns. But the main idea behind the Nerf Modulus system (a single core blaster which you can attach a bunch of modular accessories) isn’t new at all. But Nerf blasters have been doing that for nearly a decade now. Just take a look at the original 2008 Recon or 2006’s Longshot, which came with modular parts. Here’s the difference: you don’t need to buy a $50 box set and then go hunting through a toy store or eBay or Goodwill for that part you crave which only ever came with one gun back in 2010. If you want any single piece of the Modulus set—right down to the blaster—you can get them piecemeal on Amazon. And it’s awesome. They don’t take up shelf space or ship in fancy cardboard boxes. Just a part, with free Prime shipping, sent directly to whoever wants it. Genius. They don’t necessarily make it a better blaster, but they definitely set mine apart from others at the park. Or how about my Elite Alpha Trooper with the same stock and a transparent dart shield up top? It’s a little odd that Nerf made all the new Modulus parts white when most blasters that can use them are blue, but perhaps parent company Hasbro is hoping it’ll help them sell more white blasters in the future. The $10 Red Dot Sight, which actually tries to helps you aim high enough to hit with a Nerf dart. The $7 Drop Grip, the first and only official Nerf vertical foregrip that fits adult hands and doesn’t jiggle a ton. The $12 Flip Clip, which (at 24 darts) gives you the most ammo of any single dart holder you can currently buy for a Nerf blaster. The $8 Distance Scope, which is just a prop with no magification, but at least it looks cool on most Nerf guns and has sights that line up. The $8 Pivot Grip. Jiggles around. The $8 Targeting Scope. Only has one sight—nothing to line up with. The $8 Blast Shield. Who protects themselves in a game of Nerf? The $9 Bipod Upgrade. Not even remotely stable. The $7 Proxmity Barrel. Doesn’t have a lock to click it in place. The $8 Long Range Barrel. YMMV but it looks weirdly small on every blaster I’ve attached it to thus far. Except Modulus, where it’s cool. The $9 ECS-10 Stock. Wiggles around, but holds an additional clip. The $12 Blaster Stock. Cool idea, but you can’t actually fire the dart without detaching the stock, because existing Nerf blasters that take stocks have bits that block the barrel. And you can’t remove the stock without two hands. The $30 Modulus blaster itself—unless you’re going to do something about the grip. Wait, what’s wrong with the Modulus blaster? Oh, nothing much: it’s just that the one critical piece you can’t replace is the blaster’s primary handle. For whatever reason, Nerf decided to make the handle and trigger super skeletal, with rough edges that can dig into hands and gaps that can pinch skin. The main differences are just that the Modulus is a little bit longer and lighter, and trades the underbarrel rocket launcher for three extra accessory rails, a carry handle up top, and a battery compartment that’s moved underneath a new grey foregrip. But for me, none of these things trump the fact that the Modulus makes my hand sore. The Demolisher doesn’t have that problem. 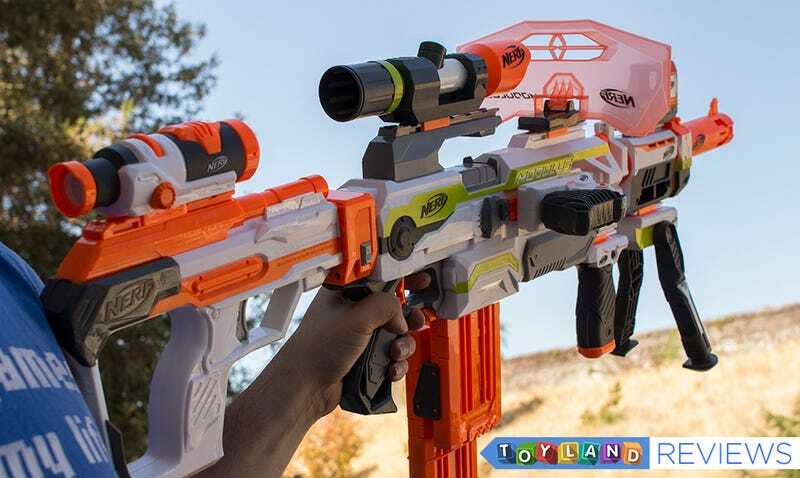 ...the Demolisher is still going to be our recommendation for the best all-around Nerf blaster. You just might want to use your Amazon Prime account to add a scope or something, too.